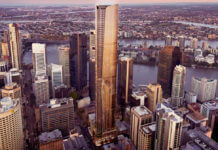 Metro Property Development has submitted a proposal to build three residential towers located at 1 Cordelia Street, South Brisbane, a 4,658m2 site bordering Cordelia, Peel and Boundary Streets. Known as ‘New World Towers‘ the project includes two 30 storey residential towers and one 10 storey residential tower. Designed by bureau^proberts, the development includes a central recreation zone with pool, cinema, bbq and garden. Three retail tenancies are also planned for each corner of the site. 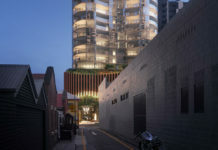 The proposal aims to deliver approximately 602 apartments, including podium townhouses and apartments with footpath access to provide street activation along with retail tenancies on all three street corners. 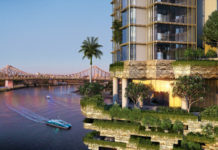 The residential offering will include a diverse range of living typologies in one, two and three bedroom configurations catering for a wide demographic of owner occupiers and investors. Also included in the proposal is approximately 400 sq.m. of convenience retail. The DA number for this development is (A003941060). What a great design, wow metro build some great buildings. Another boring, cookie-cutter glass and concrete monstrosity. Do any developers in this city have any imagination at all? I guess there are chumps queuing up buy this crap as usual. Great Development, and what a place to work and live. Close to parks, recreational areas, art centers, good coffees and work (if you work in the CBD). We need more of this, and less urban sprawl!!! There is/was a real opportunity to take a key site on Boundary Street, West End and extend both the feel and retail of one of this city’s remaining highstreets. The edges of this site are very long yet the street level interaction appear poor. The small number of street level storefronts and community uses is a significant shortcoming. The precise location of service access needs further work. The prospect of lifting the communal areas off the street level into the podium is problematic. I wonder if the architects in this design have resolved the challenge of varying levels across three street frontages in a way that recognises the potential for adding to the life in this part of the suburb? A decent design that should look good for some time yet. Much better than most things going up in and around brisbane.